Camp Caillet offers a large open space with excellent camping and gathering spaces for you and your wedding party. Looking for a location where your guests can relax, space for open-air dining, camping in the tree-covered campsites - choose Camp Caillet. The location, just outside Nanaimo, is perfect for visiting guests and we have a large parking lot with overflow parking on the main field. Access to the camp is wide enough for additional trailers and RV's to be brought on site as accommodation, additional washrooms and shower facilities for your wedding party. Our commercial kitchen is ideal for your caterers and provides plenty of space and serving for meals. All wedding parties can be secured during the months of June, July and August. Unfortunately, outside of these times we cannot guarantee availability due to regular bookings at the campground. A deposit of $1,000 CAD is required at the time of booking to secure your reservation. Our wedding rate is $1,500 to cover the full use of the campground and its facilities for a 2 day period. Additional days (setup/breakdown etc) can be secured for $250/day. 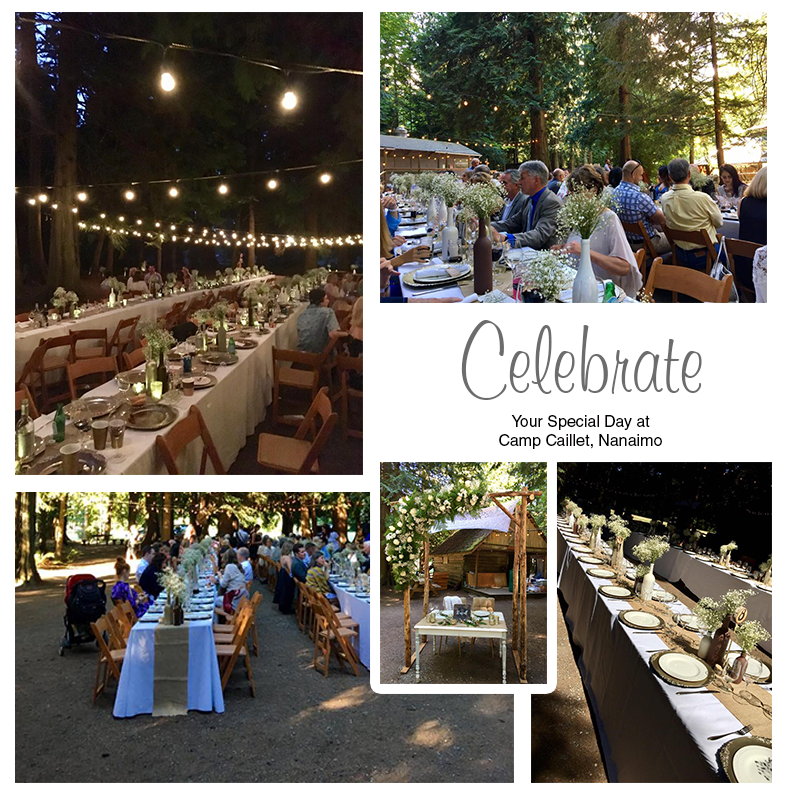 All wedding parties must be accompanied by a certificate of general liability specifically for your event that indemnifies Camp Caillet, its Management Team and Scouts Canada against any and all claims. General Liability can be purchased from any mortgage broker and costs in the region of $150. Camp Caillet is located in the governance area of the Regional District of Nanaimo. If you are proposing loud music, the bylaw states that it must cease by 11pm. An extension to this bylaw may be made under license by application to the RDN. To place a wedding reservation, visit the Booking Page and select Wedding from the booking type at the top of the form. Once you have completed the form, a cost calculation will be shown for the dates selected and you will receive an email with instructions for your deposit and return of the rental agreement. Your booking will not be confirmed until the deposit has been received. ii) We have received no complaints from the Regional District of Nanaimo regarding excessive noise after 11pm. We reserve the right to hold your deposit for up to 30 days to give appropriate time for any formal complaints to be made. We require payment at the time of booking using a valid credit or debit card.